Cranberry juice has long been known to women for its ability to help maintain the health of the urinary system. However, cranberry juice is very sharp to the taste and consequently commercial cranberry drinks are laden with sugar and high in calories. A pink soluble sugar free powder. Aids in the prevention of urinary tract infections. Could reduce the risk of kidney stones. A convenient alternative for those who dislike fresh cranberry juice. 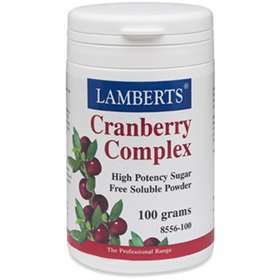 Lamberts Cranberry Complex is produced from fresh mature cranberries which are first washed and depectinised to remove unwanted substances. The juice is then dehydrated at low temperature and then pressure and spray dried to produce a sugar free concentrate. This ensures that the unique properties of cranberries may be enjoyed by those following sugar-restricted diets. Approximately 25 grams of fresh cranberries are used to produce just 1 gram of our concentrate. Cranberry Complex is mixed with a complex carbohydrate called fructo-oligosaccharide (FOS), a sweet, easily dissolved substance extracted from chicory root. FOS acts as a prebiotic, which means it encourages the growth of friendly bacteria, which help to suppress pathogenic, troublesome bacteria. 5 to 10 grams daily. 5 grams is equivalent to 1 teaspoon. Vitamin C 60mg, Cranberry Powder 2470mg, Fructo-Oligosaccharides 2470mg. Ingredients: Cranberry Juice Concentrate Powder, Fructo-Oligosaccharides and Vitamin C.